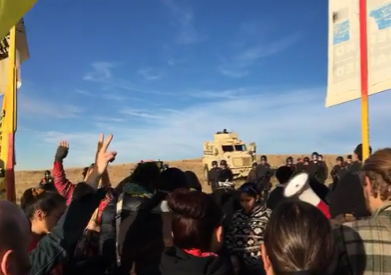 Please watch the video posted by Wiyaka Eagle Man, the police, the military, armored vehicles, assault rifles, they are chasing our people, surrounded our people, chasing them into the river. I started crying, holding my baby daughter, because we come from so much people who were chased down, hunted down and gunned down by the military and the police. History is repeating itself. All those stories we were raised with, that we carry in our hearts, of our people, fleeing, running, racing, for our lives, just to live. We are the grandchildren and great grandchildren of those who survived the US Government federally mandated massacres on our people. SEND YOUR MEN AND WOMEN WARRIORS HERE!! Come back to Standing Rock's northern border, all Ocheti Sakowin, all nations, all people. Come be a witness for the water and for the world. Come stand and protect our people and our water and our future. Please. Remember all those caravans from Pine Ridge, Cheyenne River, Lower Brule, etc., come back, and come now. Even if you have to walk. Who am I to ask this of our people, the people, I really am nobody or nothing but I am a mother and a teacher of children from Standing Rock. I grew up on the Missouri, this is my home. And my family has lived along the Missouri since 100 years before the stars fell (1730) according to our families winter count. I know there are so many sacred sites, prayers sites, grave sites, that are being plowed over. I know what is at stake. Our water is our first medicine in our historical and LIVING traditions. It is the main component in all our ceremonies. It is the very reason we are alive. Please come or come back to Standing Rock. Now. This cannot be posted to Twitter, either. They are blocking reference to this for unknown reasons. Copy/paste then publish it on Twitter piece by piece if necessary. Get the word out. Censored News continues to post images, and Tweets, on Twitter. But our links are blocked. Twitter will not respond as to why. "As we know now, we must fight against injustice, against slavery and terror. Because these 3 scourges are what makes silence reign among men, what builds barriers between them, what renders them invisible to one another and prevent them from finding the only value that might save them from this desperate world: the extended of man’s struggling against fate."